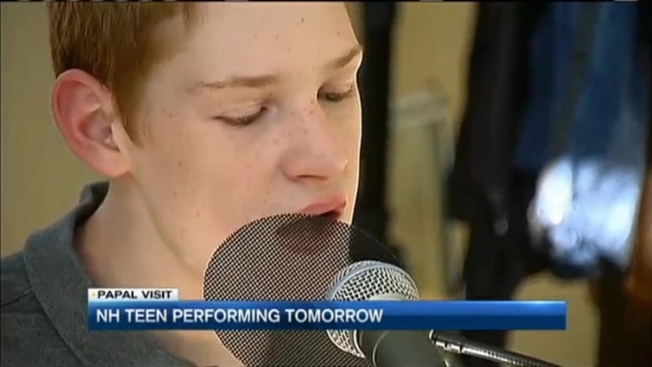 A teen from Manchester, New Hampshire, will perform two songs in Philadelphia Saturday in front of more than a million people, and maybe even the pope. By the sound of his music, you'd never know Christopher Duffley can't see the instrument in front of him. "Blindness and autism do not define me, it's just an inconvenience," Duffley told necn. "I've been given the gifts of singing and playing the piano at the same time." Duffley has been performing since he was four years old. And while he's had the honor of singing at Fenway Park, and producing two albums with his family's ministry, Know Greater Love Ministry, his greatest honor yet, is just one night away. "Saturday is actually going to be pretty exciting," Duffley said. He'll be performing two songs in five languages at the World Meeting of Families in Philadelphia. "I am going to be on eight minimum Jumbotrons, believe it or not, around Philadelphia," he said. "Eight minimum." Duffley was invited by the Archdiocese to help celebrate Pope Francis's trip to the United States. "He's very caring, the words he said slowly but surely were from his heart," Duffley said. "This pope is a special pope and he is crossing all boundaries," she said. "There is a special way about him that reaches out through cultures and every nation, so it is wonderful to see." Duffley has been told that Pope Francis will not be attending his performance, but will be resting somewhere nearby. Because of all those jumbotrons, Duffley thinks the pope might be able hear his music. "It is likely he will hear me sing, but probably a 50-50 chance," he said. On Saturday, the 14-year-old will send a powerful message to more than a million people. "Every child has a gift, every child has great worth and great meaning, and that life is precious," Christine said. Another performance will be solid proof, you don't need to see to have a vision of hope. To learn more about Christopher Duffley, his family's ministry, and his music, go to www.ChristopherDuffley.com.